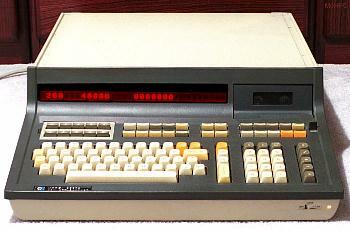 The HP 9800 Model 30 (HP 9830A) was introduced in December of 1972, along with the 9810A and 9820A calculators. The 9830A came with built-in BASIC language and 3,520 bytes of RAM. It had a full keyboard, a 32-character red LED display (alphanumeric) and a cassette tape drive. It could be expanded via five Option ROM slots (plus three more internally) and four peripheral interface slots. Later, mass storage was available via the HP 9800 Mass Memory Subsystem. The 9830B was introduced in 1976 and came with 15,808 bytes of RAM. It included string and matrix operations, which were optional in the 9830A. The machine could be upgraded to 30,144 bytes of RAM. The HP9830 may have been the first "personal computer." It was the earliest all-in-one machine that you plugged into a wall outlet and could enter BASIC language programs. Since the BASIC language was held in ROM there was no need to load anything, and it did not require the connection of an external terminal or data storage device. I am interested in acquiring and preserving the HP 9830 and associated peripherals, manuals and other documentation, including the hardware for the HP 9880 mass storage system (HP 11273B Plug in ROM block, HP 11305A Controller, HP 9867A and/or HP 9867B Disc Drive Memory, and HP 12869A Cartridges). I am also interested in third-party equipment, boards and manuals, such as those made by Infotek Systems. If you have any of this equipment or know where to find it, please send me an e-mail. We are able to recover data from cassette data tapes (HP 9162-0050 and HP 9162-0053) and provide the results to you in a more modern format (CD, DVD, floppy disc, web page, etc.). We also provide translation services to convert old HP BASIC programs into Linux, Windows or Mac OS applications. Remove the top cover, PCB hold-down (1 screw) and keyboard (4 screws underneath). Remove all the PCBs and modules. The display board has 1 screw in the center, the PSU board (rearmost in the machine) has 2 countersunk screws on the heatsink bracket. The tape drive is held down by 2 screws, the ROM module cage by 4 screws. Inspect all parts for burnt/damaged components, etc. Check the setting of the voltage selector switches at the back, and the rating of the 2 fuses. Put the PSU board back in place and fit the screws. Connect the keyboard mains switch cable (the 6 pin mate-n-lock), but do not connect the logic cable (paddleboard to backplane edge connector) yet. Connect mains, and check the voltages at the marked testpoints on the PSU PCB (this PSU will run fine with no load). If everything checks out, unplug it from AC power, put the boards back in place, connect the keyboard logic cable and refit the keyboard. Apply AC power and see if it works. On the three test points, the voltages are 18.6V, 22.7V, and -12.2V. These levels may actually be substantially higher than the text on PCB reads, given that the PSU is now totally unloaded. The 9830 is programmed in the BASIC language. Option ROM cartridges added keywords and functions to perform additional operations. The 9830 BASIC language was later ported, with updates, to the HP 9831 computer. This text is taken from a Technical Data sheet dated December 1974. The HP 9830 is a general purpose, desk-top calculator with the power and peripherals necessary to solve complex engineering problems, provide reports for accounting services, generate medical diagnoses... in other words, compute answers for a wide range of applications. The 9830 provides you with a standard read/write memory of 4K bytes, expandable to 16K bytes. And it has a built-in BASIC language compiler which provides an additional 16K bytes of hard-wired memory. You can further expand the computational capacity and peripheral control functions with read-only-memory (ROM) modules. Using the ROM's and expanded memory features, the 9830 becomes a 48K-byte computing calculator. Complementing the memory is a built-in cassette providing an additional 64K bytes of data or program storage. Your programs or data can be entered into the 9830 by cassette or by the typewriter-like keyboard. During calculator programming or programming execution, the 32-character LED display gives you crisp, alphanumeric messages or presents results. The 9830 is designed to allow you to easily configure a system to meet your present needs and still allow for expansion to meet future needs. You can choose from tape readers, tape punches, typewriters, line and page printers, digitizers, plotters, data communications interfaces, cassette memories, a 4.8M byte mass memory subsystem, and a selection of general purpose interface cards, plus pre-recorded softare Pacs. The HP 9830 calculator design allows the addition of up to eight Read-Only-Memory modules. Five may be added as external plug-ins, three as internal plug-ins. Add-on ROMs provide additional capabilities to the 9830, permitting extension of the BASIC language with little change in the amount of read/write memory available to the user. There is no difference in the operation of a ROM whether installed externally or internally. It is a simple matter of available space and design. HP 11270 Matrix Operations Allows the user to add the matrix capability commonly found in BASIC to the 9830 calculator. HP 11271 Plotter Control Provides the HP 9830 Calculator with the additional commands that are necessary for easy control of the 9862 plotter. HP 11272 Extended I/O Allows the user to command a wide variety of peripheral devices with the 9830 Calculator. The most important features in this ROM are the enter/output statements and an automatic code conversion capability. The ENTER statement enables the calculator to receive data from an external device. The OUTPUT statement is a general-purpose means to send data or coded commands to an external device. HP 11273 Mass Memory Control Designed for use with the HP 9880 Mass Memory Subsystem. This ROM enables the 9830 calculator to generate the necessary commands to write into, and read from the mass memory. HP 11274 String Variables Allows the 9830 to accept and manipulate alphabetical, as well as numerical, information. The 11274 ROM expands the language of the 9830 to include string variables. HP 11277 Terminal 1 The HP 11277 Terminal 1 ROM (along with the HP 11206A Modem Interface Card) allows the 9830 calculator to be used in conjunction with a modem or acoustic coupler as a terminal to a remote time-share system. Basically, the ROM makes the calculator work like a teleprinter when communicating with a time-share system. HP 11278 Batch BASIC Enables the 9830 calculator to interpret Educational BASIC Cards (HP Part No. 9320-2051) using the 9869A Calculator Card Reader. A number of different programs can be 'stacked' and executed consecutively without further instructions from the calculator keyboard. HP 11283 HP 9871A Printer Control Provides additional statements to the vocabulary of the 9830 that permit simple control of the HP 9871A Printer. HP 11289 Advanced Programming 2 Provides increased performance in the operation of the 9830 in commercial and large data base operations. HP 11296 Data Comm 1 Interface Control Along with the HP Interface Cable (HP 11284), provides basic data communications, including 9830-to-9830 and 9830-to-terminal commuunication. HP 11297 Data Comm 2 Binary Synchronous Along with the HP Interface Cable (HP 11284) and the HP 11296 ROM, the 9830 can communicate with a computer as a programmable binary synchronous terminal. HP 11298 Data Comm 3 Interactive Along with the HP Interface Cable (HP 11284) and the HP 11296 ROM, it allows the 9830 calculator to look like an initeractive teleprinter to a time-sharing computer. In order to connect the 9830 calculator to one or more peripheral devices it is necessary to utilise the correct interfacing equipment. Generally, an HP calculator-to-peripheral interface comprises an encased printed circuit interface card with 1.82 m (6 ft.) of interconnecting cable terminated in a connector compatible with the peripheral. With some interface configurations it is necessary to install additional read-only-memory (ROM) in the calculator. A range of special purpose ROM's are made for the 9830 and the calculator has provision for the installation of them without the need for any modifications. HP 11202A I/O Interface When used with the Extended I/O ROM, the 11202A will input or output data in a number of formats. The 11202A is analogous to an 8-bit computer duplex card with the distinction that data buffer storage is provided for only one transmission direction at a time. HP 11203A BCD Input Provides the 9830 calculator with an interface to a variety of instruments having parallel Binary Coded Decimal (BCD) outputs. Direct interfaces are possible to a large number of Hewlett-Packard Digital Voltmeters, Frequency Counters, and other instruments. When used with the proper Extended I/O ROM, the 11203A has capacity for up to nine digits of data, with function, range, sign and overload condition. HP 11205A Serial I/O Enables the 9830 calculator to interface to a wide variety of peripheral equipment conforming to EIA specification RS-232C. It is widely used to output to teleprinters, but is also able to communicate with teletype replacement devices, CRT terminals, page printers, and electrostatic printers/plotters. Asynchronous data rates from 110 to 1200 baud are available. HP 11206A Modem Interface The HP 11206A Modem Interface (along with the HP 11277 Terminal 1 ROM) allows the 9830 calculator to be used in conjunction with a modem or acoustic coupler as a terminal to a remote time-share system. Basically, the configuration makes the calculator work like a teleprinter when communicating with a time-share system. HP 11284A Data Communications Interface The HP 11284A Interface comprises two encased printed circuit cards, 2.73 m (9 feet) or cable and connectors compatible to the peripheral. Along with three ROMs (HP 11296, HP 11297 and HP 11298), various configurations of data communications interface for the 9830 calculator can be assembled. These interfaces allow the 9830 to communicate with computers, or other 9830's, via telephone lines and modems. HP 59405A HP Interface Bus Provides the 9830 calculator with an interface to the Hewlett-Packard Interface Bus (HP-IB). Up to 15 HP-IB compatible instruments can be interconnected simultaneously using this simple one-cable system. The HP 59405A plugs directly into any I/O slot on the calculator. A suitable ROM, provided with the 59405A, must be plugged into the calculator to complete the interface. The 59405A has a fixed select code of 13. HP 9868A I/O Expander The 9830 calculator has four I/O slots for the connection of peripherals and interfaces. By connecting the HP 9868A I/O Expander to the calculator, the I/O capacity is increased to 13 (the 3 remaining spare on the calculator and 10 in the expander). A built-in power supply insures that there is no additional power drain on the 9830 and it has reserve power enabling the connection of specially designed interfaces. 1.82 m (6 feet) of cable is provided with the expander. The 9830 came with a tape cassette mass storage mechanism built by International Computer Products of Dallas, Texas. Although HP sold tapes specifically for the mechanism, it also worked fine with ordinary audio cassette tapes. The tape drive is much slower than the tape drives on other HP models of the period, however the tapes themselves are more reliable. A single tape cassette could hold up to 80K of information. Unlike audio cassette recorders, the 9830 tape drive does not use a capstan and pinch roller, it simply drives the spools. This results in a non-constant tape speed, however the data encoding is essentially self-clocking. Data is stored on the tape in two tracks. A pulse on one track is a 0 while a pulse on the other track is a 1. A pulse on both tracks simultaneously is a word marker. Tape words are 9 bits long. The middle bit of a word is used to indicate a file header. The following four pages are scans of a technical data sales brochure from May of 1974. Loveland - HP has begun marketing the first desktop calculator to use a standard language that simplifies operation while greatly increasing flexibility. The new Model 9830 programmable calculator has a typewriter-like keyboard which enables the operator to communicate with the calculator in BASIC language. BASIC, widely used in the computer industry, is similar to English. Coupled with BASIC, the 9830's 40 kilobyte system enables the calculator to utilize a wide range of existing software packages in finance, mathematics, statistics, structures and secondary education. The new calculator is designed for education, business, scientific research and engineering applications. A basic unit costs $5,985. Deliveries will begin early in 1973. Also new is the Model 9866 page-width printer (priced at $2,975) which prints at 250 lines per minutes. A built-in cassette tape drive provides basic memory of 50,000 bytes. The Model 9830 can operate with a wide range of peripherals including the new page-width printer, typewriters, plotters, digitizers, tape readers and card readers. This advertisement appeared in the June 1975 issue of IEEE Spectrum magazine. Does anyone have a copy of the 12-page brochure mentioned here, HP Calculator-Aided Design: Computing Power for Engineers in Electronics? Click here for a comprehensive Wanted page.